Square measures 6-1/2" x 6-1/2"
Stitches used: ch, sl st, sc, sc ps, dc. push puff to front of work, work next st. Begin the first row by working the first sc in the 2nd ch from the hk. 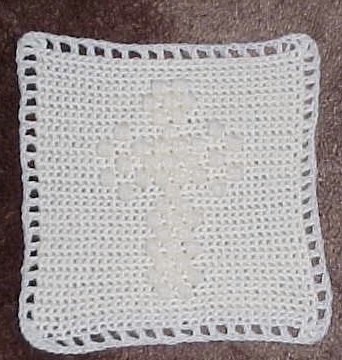 Square is 31 x 31 stitches. Ch 1 and turn at the end of each row. EDGING: Ch 4, turn after the last charted stitch. * sk next st, dc in next st, ch 1. Rep from * around the entire square being sure you have 3 dc (don't forget to chain after each of them) in each corner. End the border by placing 2 more dc in the last corner, ch 1 and join with a sl st in the 3rd ch of the beg ch 4.